Frame Size(h x w) 19" x 52"
*5 Min. Easy Instal. Kit Included. We recommend that you call us before ordering to check if this is the right sign for you. IR Remote Controlled Display - Up to 99 messages and 500 characters per message , over 300 Icons and Symbols, Time and Date Display with Auto Timer. Up to 7000nits High Quality Brightness for Day and Night time use, Great Visibility even in direct Sun light , Made for Both Indoor and Outdoor Use, Water proof. 1 Year Full warranty + 2 Year limited (Factory labor only) Warranty Included, 1 on 1 Live Customer Service. Made in USA. UL listed signs are available at your request. Manufacturer: LED Super Store Corp. Brand: LED Super Store Corp. Publisher: LED Super Store Corp. Studio: LED Super Store Corp. 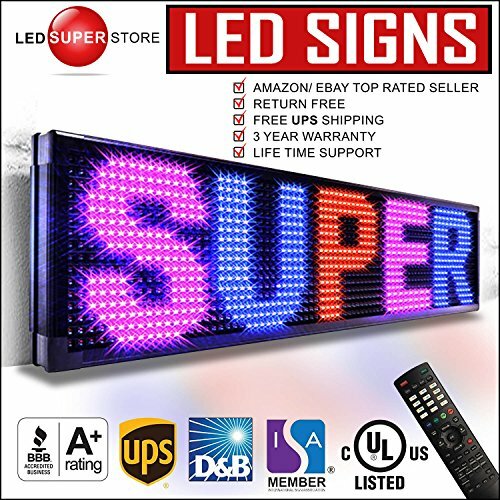 If you have any questions about this product by LED Super Store Corp., contact us by completing and submitting the form below. If you are looking for a specif part number, please include it with your message.